The U.S. government continues to try to cope with the rise of the drones, both those in their own hands and in yours. Now the world’s most well known top-secret facility, Area 51, is trying adapt as well. Ironically, what is surely the most cutting edge of drone-testing facilities in the entire world wants to make sure that you keep your drone in the trunk when approaching its borders. 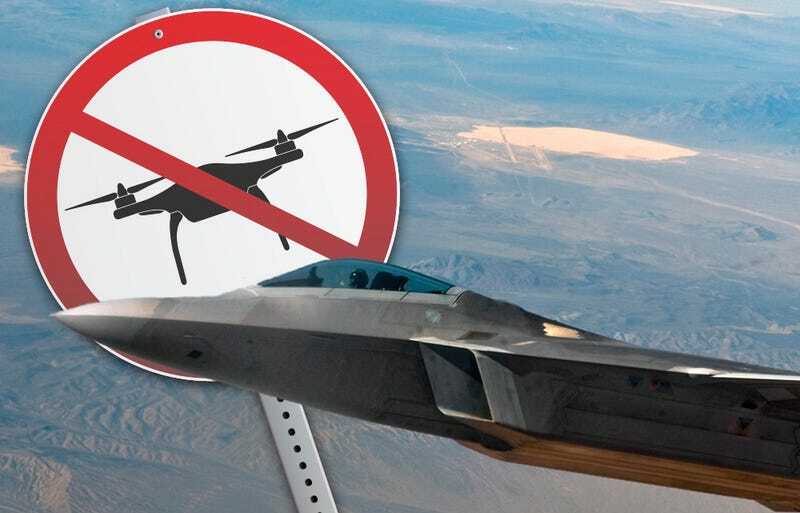 It makes total sense that one of the most heavily guarded pieces of property in the world, where secret flight testing is its reason for existing, doesn’t want civilian operated drones equipped with cameras buzzing around its perimeter. There is also the case of the notorious low-flying HH-60G Pave Hawk helicopters that aggressively patrol Area 51's edges. A hobby drone could inadvertently cause one of these helicopters to crash, should there be a collision. These new signs at Area 51 are not really unexpected. The FAA is cracking down on hobby drones and now requires those weighing over half a pound to be registered. Additionally, Foxtrot Alpha has reported for years that hobby drones could be used for very nefarious purposes—something the military is coming to grips with now. Due to many near-collisions with commercial aircraft, the FAA is also working toward informing the public of where it is acceptable and not acceptable to fly drones. Now, according to this new signage, the edges of Area 51 appear to be on the no-drone list. Photo credits: F-22/Groom Lake shot via USAF, sign art via Thomas Pajot/Shutterstock, FAA Drone info graphics via FAA.